This article is about the film. For the soundtrack, see Ralph Breaks the Internet (soundtrack). Ralph Breaks the Internet is a 2018 American 3D computer-animated comedy film produced by Walt Disney Animation Studios and distributed by Walt Disney Pictures. It is the sequel to the 2012 film Wreck-It Ralph, making it Disney's 57th feature-length animated film. The film was directed by Rich Moore and Phil Johnston (who wrote the screenplay with Pamela Ribon) and executive-produced by John Lasseter, Chris Williams and Jennifer Lee. [a] It features voice work by John C. Reilly, Sarah Silverman, Jack McBrayer, Jane Lynch and Ed O'Neill (reprising their roles from the first film), with Alan Tudyk returning to voice a new character and new additions to the cast that include Gal Gadot, Taraji P. Henson and Alfred Molina. The first discussions about a sequel to Wreck-It Ralph began in October 2012, and the new installment went through three different scripts before the filmmakers settled on the final plot. When the film was officially announced in June 2016 as Ralph Breaks the Internet: Wreck-It Ralph 2, much of the original cast confirmed they had signed on, with new cast members added in 2018. It is Walt Disney Animation Studios' first animated film sequel to be created by the original film's writing and directing team. Ralph Breaks the Internet had its world premiere at the El Capitan Theatre in Los Angeles, California, on November 5, 2018 and was released in the United States on November 21, 2018. The film has grossed over $528 million worldwide and it has received mostly positive reviews from critics, who called it a "worthy successor" and praised the animation, humor, characters and plot, as well as the vocal performances of Reilly and Silverman. The film was nominated for Best Animated Feature at the 91st Academy Awards, 76th Golden Globe Awards, and 24th Critics' Choice Awards. Six years since their previous misadventures, Wreck-it Ralph and Vanellope Von Schweetz have been best friends, hanging out every night after work in Litwak's Family Fun Center and Arcade. While Ralph is content with his current life, Vanellope admits to being bored with her game's predictability and wishes for something new. One day, Ralph attempts to fulfill her desires by creating a secret bonus track during a race. Vanellope overrides player control to test it out, but the resulting conflict between her and the player results in the cabinet's steering wheel being broken. Since the company that made Sugar Rush is defunct, one of the kids finds a replacement for Mr. Litwak on eBay. However, Litwak deems it too expensive and has no choice but to unplug Sugar Rush, leaving the game's characters homeless. That night, after talking with Fix-It Felix Jr., Ralph decides to enter the internet via Litwak's recently installed Wi-Fi router to obtain the new wheel on eBay. Ralph brings Vanellope with him, and although they place a winning bid of $27,001 to obtain the wheel, they cannot pay and must make the purchase within 24 hours. The two turn to J.P. Spamley to quickly make money, receiving a lucrative job of stealing a valuable car belonging to Shank from the Slaughter Race. Ralph and Vanellope steal the car, but are forced to return it. Shank compliments Vanellope's driving skills and points the duo towards Yesss at BuzzzTube, where Ralph decides to make a series of viral videos playing off popular trends to get the money. As Ralph's videos become a viral sensation, an excited Vanellope joins Yesss's staff in spamming users with pop-up ads. Ralph convinces Yesss to send Vanellope to Oh My Disney, where she meets and befriends the Disney Princesses, being encouraged by them to address her sense of unfulfillment and reaching a musical epiphany when Ralph calls her upon earning enough money to purchase the wheel. When Vanellope does not show up at eBay, Ralph's second call causes him to overhear her confessing to Shank she wants to stay in Slaughter Race because its unpredictability and challenges made her feel more alive than she did in Sugar Rush. Horrified at the thought of Vanellope leaving him, Ralph turns to Spamley for a way to make Slaughter Race unsatisfying for Vanellope by slowing down everything in the game. Spamley takes Ralph to meet Double Dan, the creature of the dark web, who gives him Arthur, an insecurity virus, which replicates any flaw it finds. When Ralph unleashes the virus in Slaughter Race, it unexpectedly replicates Vanellope's glitch across the game, triggering a server reboot and forcing Ralph to rescue Vanellope before the reboot deletes her from the game. Vanellope assumes the crash was her fault, but a guilty Ralph confesses to her what he had done. Feeling betrayed, she furiously disowns Ralph as her best friend and symbolizes it by throwing away the hero medal. While Ralph recovers the now broken-in-half medal, Arthur scans him and duplicates his personality flaws. This creates a legion of extremely possessive Ralph clones that cause serious damage to the Internet on a rampant search for Vanellope. The real Ralph finds her, and they work with Yesss to lead the clones into an antivirus software district, but the clones combine into Ralphzilla, a gigantic Ralph automaton. Seeing Ralph is fighting a losing battle, Vanellope surrenders herself, but Ralph refuses to accept this. He confronts his clones, owning up to his selfishness and possessiveness of Vanellope in the process, telling them physical separation does not mean the end of their friendship. With his insecurities resolved, the clones disintegrate, and the Internet is restored, while Ralph is saved from falling to his death by the Disney Princesses. Later, Shank arranges for Vanellope to respawn in Slaughter Race, allowing her to stay. Ralph gives her half of the broken medal as they both bid a tearful farewell. As Sugar Rush is plugged back in, Ralph returns to the arcade and comes to terms with Vanellope's absence as he partakes in social activities with other game characters while staying in touch with Vanellope through video chats. Sarah Silverman as Vanellope, a glitchy racer who is the main character of Sugar Rush and Ralph's best friend. Gal Gadot as Shank, a tough and talented NPC racer in Slaughter Race, a racing-centered MMORPG introduced in the film. Taraji P. Henson as Yesss, an algorithm that determines the trending videos on BuzzzTube (a portmanteau of YouTube and BuzzFeed). Parts of her character were modeled after Cruella de Vil, as both characters are seen as fashionable. Jane Lynch as Calhoun, the lead character of Hero's Duty and Felix's wife. Alan Tudyk as KnowsMore, a character representing a search engine of the same name, with an over-aggressive autofill. The character design was mainly inspired by that of the UPA "limited animation" films, as well as Professor Owl from the Ward Kimball-directed Adventures in Music shorts. Tudyk previously voiced King Candy in the first film. Alfred Molina as Double Dan, a half-worm virus creator who inhabits the Dark Web. Molina also voices Double Dan's conjoined brother Little Dan. Ed O'Neill as Mr. Litwak,:3 owner of Litwak's Family Fun Center & Arcade. John DiMaggio as Arthur,:4 an insecurity virus. DiMaggio previously voiced Beard Papa in the first film. All of the characters in the Disney Princess line appear along with Anna and Elsa from Frozen and Moana from Moana. They were all voiced by their traditional voice actresses, except for Cinderella and Aurora, who were voiced by current voice actresses Jennifer Hale and Kate Higgins respectively, and Snow White, who was voiced by screenwriter Pamela Ribon as opposed to Katherine Von Till. Adriana Caselotti and Ilene Woods, the original voices of Snow White and Cinderella, died in 1997 and 2010 respectively, while Mary Costa, the original voice of Aurora, is the only original voice actress not to reprise her role as Aurora due to old age. Additionally, Rajah (Jasmine's pet tiger), Meeko (Pocahontas' pet raccoon), Cinderella's mice and bird companions, and Prince Naveen (in frog form) also appear in the film. The film's directors Rich Moore and Phil Johnston voice bidders at an eBay auction, in addition to reprising their roles as Sour Bill, Zangief (Moore) and the Surge Protector (Johnston), respectively. :4 YouTube personalities Colleen Ballinger, Dani Fernandez, Ravi Fuad and Tiffany Herrera also voice cameos. Similar to the first film, Ralph Breaks the Internet includes a number of cameos and references to video games and various Disney properties, including their own films, Pixar films, and the Star Wars, Marvel Comics, and The Muppets franchises. The band Imagine Dragons (whose song "Zero" is featured in a trailer for the film, as well as its soundtrack) make a cameo appearance in the film, with the members voicing themselves. :4 The Floss dance, popularized by Fortnite and its battle royale mode is seen in the film, along with the battle bus featured in the game. Stan Lee, Marvel Comics' former writer, editor and publisher, makes a cameo appearance in the film talking to Iron Man. The filmmakers revealed that the film originally featured a joke about Kylo Ren being a "spoiled child", which was later cut from the film by request from Lucasfilm because it would undermine his role as a villain. Also cut from the film was C-3PO being mockingly called R2-D2 and BB-8 by princesses Cinderella and Aurora, respectively. In addition, the film would originally include The Golden Girls characters, but it was later cut because the directors felt it was a bizarre juxtaposition. The legion of Ralph clones which forms a gigantic Ralph monster, which resembles the King Kong character from various films. During the production the giant form was dubbed "Kong Ralph" (after King Kong) and "Ralphzilla" (after Godzilla). In October 2012, director Rich Moore said that he and Disney had ideas about a sequel that would bring the characters up to date and explore online gaming and console gaming. Moore stated that many of the crew and voice cast were open to the sequel, believing that they have "barely scratched the surface" of the video game world they envisioned. He also stated that he planned to include Mario and Tron in the sequel. (In the end, only the latter appeared briefly, serving as a minor foreshadowing plot device.) In 2014, the first film's composer Henry Jackman said that a story for the sequel was being written. In July 2015, John C. Reilly said he had signed on to reprise his role of Ralph in a projected sequel. On March 24, 2016, Moore stated that a sequel was still being planned. Moore specifically stated that a sequel would include an appearance from Mario, citing a "good relationship with Nintendo". On June 30, 2016, Walt Disney Animation Studios announced that the sequel would be released on March 9, 2018, with Reilly, Moore and writer Phil Johnston attached, and that it would focus on "Ralph leaving the arcade and wrecking the Internet". In March 2017, the sequel's title was officially announced as Ralph Breaks the Internet: Wreck-It Ralph 2, with Moore returning as director joined by the first film's co-writer, Phil Johnston, in his directing debut in an animated film and Clark Spencer also returning as producer. In July 2018, Disney removed Wreck-it Ralph 2 from the film's title. Two working versions of the script had been scrapped before settling on the one used for the film, according to head writer Josie Trinidad. In one version, Vanellope had become self-absorbed by the Internet, gaining popularity and becoming a celebrity among the users. Ralph had been thrown in jail where he met the search engine Knowsmore, and they had partnered together to escape prison and help bring Vanellope back to her normal self. A second version had Ralph becoming an Internet-famous celebrity, and would have been challenged by an anti-virus program named Bev that served as a super cop and would have been the story's villain. Trinidad said neither of these versions captured what they felt was the centerpiece of the sequel, being how Ralph and Vanellope reacted to the new world of the Internet and realizing they have separate paths going forward. The design of the scenes within the Internet was based on tours made of One Wilshire in Los Angeles, as it is one of the world's largest telecommunications centers, serving most traffic around the Pacific Ocean. The filmmakers did not approach any of the companies (outside of Disney) that are represented in the Internet, and strove to include net branding from all across the world. They also had to explore various Internet memes, making sure to avoid those that lacked long-term presence on the Internet. While the film addresses many positive elements of the Internet, the filmmakers did not want to shy away from covering some of the more unpleasant aspects about it, in part fueled by the success of tackling racism indirectly within Zootopia. Such elements include Ralph reading through comment sections on videos to find users leaving disparaging messages about him, and having the pair travel to the dark web with its activities of questionable legal and ethical status. They wanted to follow the same approach as they had with Judy Hopps in Zootopia, where she experienced, learned, and overcame the racism aspects, and have Ralph similarly learn and become a better person without having to actually solve the issue of hostility on the Internet. The scene where Vanellope is introduced to the Disney Princesses came from screenwriter Pamela Ribon. In 2014, Ribon was still working on Moana when Disney began internally pitching ideas for the sequel to Wreck-It Ralph, Ribon recognized that like the title character of Moana, Vanellope fits the definition of a Disney Princess. When work formally began on the sequel after the completion of Zootopia, Ribon pitched the idea of Disney poking fun at itself by having Vanellope meet the other Disney Princesses in the green room of OhMyDisney.com, the Disney fan-driven website. Further inspiration came from a Buzzfeed online quiz that asked which Disney Princess the user was; Moore thought it would be interesting if Ralph had encountered that quiz and ended up in an argument with Vanellope over the result. Ribon's initial script for the scene, playing off the various tropes of the Princesses such as several being kidnapped or enslaved, remains mostly intact through production. Animators had to work out various techniques to take the different styles of animation into a single approach, and figure out the proportions of the characters using official figurines. Reilly, Jane Lynch, Jack McBrayer, and Sarah Silverman were reported as being set to reprise their roles. In December 2016, Alan Tudyk confirmed his return in the sequel as a different character, named KnowsMore. In August 2018, actress Gal Gadot joined the film. The team was able to secure all the Disney Princesses' original voice actresses, except for Adriana Caselotti as Snow White, Ilene Woods as Cinderella, and Mary Costa as Aurora; Caselotti and Woods died in 1997 and 2010 respectively, while Costa retired from acting in 2000. Jennifer Hale and Kate Higgins, the current voice actresses for Cinderella and Aurora, were hired for the film; Pamela Ribon, the film's co-screenwriter, performed Snow White's voice for temporary tracks, but the team considered it a good substitute, allowing Ribon to voice her in the final film. On September 19, 2018, Imagine Dragons released the lead single from the soundtrack titled "Zero", which plays during the end credits of the movie. On October 23, 2018, the music video of "Zero" was posted on Imagine Dragons' YouTube channel. The film features an original song called "A Place Called Slaughter Race", performed by Sarah Silverman and Gal Gadot, written by Tom MacDougall and the film's co-director Phil Johnston, and composed by Alan Menken; the song's pop version, "In This Place", was performed by Julia Michaels. The film also features songs from various Disney Princess movies, as well as Demi Lovato's cover of "Let it Go" played in the beginning of the Oh My Disney scene. :9 Ralph also rickrolls the tune "Never Gonna Give You Up" by Rick Astley in a post-credits scene. The soundtrack is composed by Henry Jackman, who also composed the score from the previous film. It was released digitally on November 16, 2018, and on CD on November 30, 2018. On June 30, 2016, Walt Disney Animation Studios initially announced that the sequel, titled Ralph Breaks the Internet: Wreck-It Ralph 2, would be released on March 9, 2018. However, in April 2017, A Wrinkle in Time took over its date, and the film was pushed back to November 21, 2018. 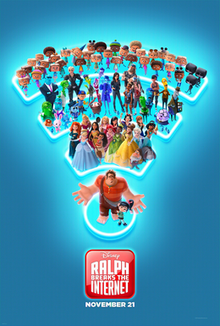 In July 2018, Disney shortened the film's title to Ralph Breaks the Internet. The film was released in 3D, 2D, Dolby Cinema and IMAX 3D. The first official clip named "KnowsMore" was released on World Internet Day, October 29, 2018. Another entitled "Hearts" was introduced on November 5, the same date on which they start selling tickets before its release. On that same day, the film made its world premiere at Los Angeles' El Capitan Theatre along with the song "Zero" played by Imagine Dragons at the event. A video clip named "There Is No Track", which focuses on the new character Shank, was released on November 8. On November 19, a video clip of Vanellope meeting the Disney Princesses was released. The film itself was released on November 21 in the United States, and November 30 in the United Kingdom. A new poster for the film was released on February 26, 2018. Two days later, a teaser trailer for the film was released on February 28, 2018, and it quickly became viral, getting more than 4.5 million views in 24 hours. A second trailer was released on June 4, 2018 with the Daft Punk song "Harder, Better, Faster, Stronger". In July 2018, Disney decided to remove the Wreck-It Ralph 2 byline circle from the film's title, leaving it as Ralph Breaks the Internet. A sneak peek of the film was released on August 10, 2018 that included the will.i.am song "Geekin'". Its final trailer was released on September 20, 2018 which included the song "Never Gonna Give You Up". Carvana and Disney collaborated to promote the film's release throughout a multi-channel campaign. Other brands who partnered with the film include BAPE, eBay, Fandango, Mailchimp, McDonalds, Netgear, Noovie ARcade, and Purple. Ralph Breaks the Internet was released by Walt Disney Studios Home Entertainment on digital on February 12, 2019, and on Ultra HD Blu-ray, Blu-ray, and DVD on February 26, 2019. Bonus features include a behind-the-scenes featurette, a short highlighting some of the Easter eggs hidden throughout the film, deleted scenes, and the music videos for "Zero" and "In This Place". A feature exclusive to the digital release is a featurette on the artists going to race car driving school to research all the driving in Slaughter Race. Ralph Breaks the Internet grossed $201.1 million in the United States and Canada, and $327.2 million in other territories, for a total worldwide gross of $528.3 million, against a production budget of $175 million. In the United States and Canada, Ralph Breaks the Internet was released alongside Creed II and Robin Hood, as well as the wide expansion of Green Book, and was originally projected to gross $67–77 million from 4,017 theaters in its five-day opening weekend. The film made $18.5 million on its first day (including a pre-Thanksgiving record $3.8 million from Tuesday night previews) and another $10.3 million on its second, increasing five-day projections to $85–95 million. It went on to debut to $56.2 million in its opening weekend (a five-day total of $84.8 million), finishing first at the box office and marking the second-best Thanksgiving opening behind Disney's Frozen ($93.5 million). In its second weekend the film made $25.8 million, dropping 54% but remaining in first. For the third weekend, it topped the box office once again with $16.3 million, dropping 36%. In its second and third weekends the film finished ahead of The Grinch, marking the first time animated films were the top two spots at the box office in back-to-back weekends. On the fourth-week box office, The Grinch ($893,640) finished ahead of Ralph Breaks the Internet until Aquaman and Spider-Man: Into the Spider-Verse topped the box office in their respective weeks. On review aggregation website Rotten Tomatoes, the film holds an approval rating of 88% based on 249 reviews, with an average rating of 7.32/10. The website's critical consensus reads, "Ralph Breaks the Internet levels up on its predecessor with a funny, heartwarming sequel that expands its colorful universe while focusing on core characters and relationships." Metacritic calculated a weighted average score of 71 out of 100, based on 43 critics, indicating "generally favorable reviews". Audiences polled by CinemaScore gave the film an average grade of "A−" on an A+ to F scale, down from the "A" earned by the first film, while PostTrak reported filmgoers gave it 4 out of 5 stars. Bilge Ebiri of The New York Times gave the film a positive review, saying that "somewhere amid the film's ornate imagery and deliriously irreverent humor, we might begin to realize that we’re watching a terrifying, incisive satire about the ways that a life lived online makes monsters of us all". Brian Lowry of CNN said that "The colorful action should delight tykes, but the smart, media-savvy asides make it especially appealing to grownups". Kerry Lengel of The Arizona Republic gave the film 3.5 stars out of 5, saying "what makes the movie compelling, despite the subdued dramatic payoff, is that it is a heightened reflection of our experience—our love affair, really—with our gadgets, our apps and, yes, our brands". Peter Hartalub of The San Francisco Chronicle also gave the film 3 stars out of 4, stating that the film is "almost always inspired in the moment" and said that "the new characters are all pretty great", though he said that the film's first third "struggles to find its focus", and felt that Felix and Calhoun's subplot "would have worked better as a pre-movie animated short". Chris Bumbray of JoBlo's Movie Emporium said that the film "is just as solid" as the first film, and said it was better than the science-fiction film Ready Player One. Bryan Bishop of The Verge describes the film as "The Lego Movie of Disney films" and "soars when it sends up the studio's own films, but its portrayal of the internet feels a little optimistic for 2018." Oliver Jones of Observer gave the film 2.5 score, saying that "Ralph Breaks the Internet is a candy coated, hard shined brick of postmodernism—a Vitamix smoothie of gags, nostalgia, product placement and Fruity Pebbles". Alonso Duralde of TheWrap said that "Within a few years, the specifics of the viral-video gags in Ralph Breaks the Internet will be as dated as a Tay Zonday joke". Peter Bradshaw of The Guardian said that the "sequel to the 2012 film is somewhere between Ready Player One and The Emoji Movie, summoning up a zero-gravity spectacle of dazzling colours and vertiginous perspectives, a featureless and inert mashup of memes, brands, avatars and jokes". Directors Rich Moore and Phil Johnston said that a Ralph Breaks the Internet spin-off film focusing on the Disney Princesses could be made depending on the audience's response, and "if there's a good story to be told". Also, John C. Reilly says that he has an idea if a third film was to be made, he would like to see Ralph and Vanellope "beaming themselves right out into space". ^ Lasseter acted as the film's executive producer until June 2018 (five months before the film's release), when he left Disney. Lee took his place as chief creative officer of Walt Disney Animation Studios and as executive producer. The two ultimately received a jointed executive producer credit, along with Williams. ^ a b c d e f g h i j k l m n o p q "Ralph Breaks the Internet – Press Kit" (PDF). wdsmediafile.com. Walt Disney Studios. Retrieved November 18, 2018. ^ a b c "Henry Jackman – Ralph Breaks the Internet – Amazon Music". Amazon. Retrieved October 21, 2018. ^ a b c d e Derschowitz, Jessica (November 6, 2018). "See the Disney princesses and other stars at the Ralph Breaks the Internet premiere". Entertainment Weekly. Retrieved November 14, 2018. ^ a b c d "Ralph Breaks the Internet (2018)". Box Office Mojo. IMDb. Retrieved April 7, 2019. ^ a b "Ralph Breaks the Internet (2018)". The Numbers. IMDb. Retrieved April 13, 2019. ^ Barnes, Brooks (June 8, 2018). "Pixar co-founder to leave Disney after 'missteps'". CNBC. Retrieved June 9, 2018. ^ Kit, Borys (June 19, 2018). "Pete Docter, Jennifer Lee to Lead Pixar, Disney Animation". The Hollywood Reporter. Retrieved June 19, 2018. ^ a b c d e f "Ralph Breaks the Internet – Production Notes" (PDF). wdsmediafile.com. Walt Disney Studios. Retrieved December 14, 2018. ^ Celestino, Mike (September 20, 2018). "INTERVIEW: "Ralph Breaks the Internet" directors Phil Johnston, Rich Moore, producer Clark Spencer on Disney sequel". Inside the Magic. Retrieved December 16, 2018. ^ Foreman, Alison (November 14, 2018). "Critics give 'Ralph Breaks the Internet' a big thumbs up". Mashable. Retrieved November 14, 2018. ^ Campbell, Christopher (November 14, 2018). "Ralph Breaks the Internet First Reviews: A Hilarious, Heartwarming Sequel". Rotten Tomatoes. Retrieved November 28, 2018. ^ a b Otterson, Joe (July 13, 2015). "John C. Reilly Says He Will Star in 'Wreck-It Ralph' Sequel". TheWrap. Archived from the original on July 14, 2015. Retrieved July 13, 2015. ^ "Sequel to "Wreck-It Ralph" Hits Theaters on March 9, 2018". The Walt Disney Company. June 30, 2016. Archived from the original on August 23, 2016. ^ a b D'Alessandro, Anthony (August 10, 2018). "Gal Gadot Buckles Up For Disney's 'Ralph Breaks The Internet'". Deadline Hollywood. Retrieved August 10, 2018. ^ a b c d Truitt, Brian (May 30, 2018). "See exclusive first photos of Taraji P. Henson, Disney princesses in 'Wreck-It Ralph 2'". USA Today. Retrieved May 30, 2018. ^ Hayes, Britt (November 26, 2018). "'Ralph Breaks the Internet' Easter Eggs and Cameos: Exploring the Countless References to Just About Everything". /Film. Retrieved December 3, 2018. ^ a b c d e f g Rougeau, Michael (September 20, 2018). "31 Things We Learned About Ralph Breaks The Internet From A Trip To Disney Animation". GameSpot. Retrieved November 21, 2018. ^ a b Han, Angie (December 5, 2016). "Alan Tudyk Will Be Back for 'Frozen 2' and 'Wreck-It Ralph 2', Wants In On Marvel's 'Guardians of the Galaxy'". /Film. Archived from the original on December 6, 2016. Retrieved December 5, 2016. ^ Laughing Place Disney Newsdesk (September 20, 2018). "New "Ralph Breaks the Internet" Trailer, Poster, Cast, and Plot Details Revealed". Laughing Place. Logo. Retrieved September 20, 2018. ^ Yasharoff, Hannah (November 20, 2018). "5 ways 'Ralph Breaks the Internet' totally nails online culture". USA Today. Retrieved November 22, 2018. ^ a b Holmes, Adam (July 14, 2017). "Wreck-It Ralph 2 Is Bringing The Original Disney Princesses Back". CinemaBlend. Archived from the original on July 16, 2017. Retrieved July 14, 2017. ^ a b c Breznican, Anthony (July 14, 2017). "Wreck-It Ralph sequel will unite the Disney princesses — and Star Wars!". Entertainment Weekly. Archived from the original on July 15, 2017. Retrieved July 15, 2017. ^ a b c d e f Johnson, Zach (June 4, 2018). "Disney Princesses Meet Vanellope von Schweetz in Wreck It Ralph 2 Trailer". E! News. Retrieved August 10, 2018. ^ a b c d Bibbiani, William (September 20, 2018). "Ralph Breaks The Internet: Inside The Disney Princess Scene Everyone's Talking About". IGN. Retrieved September 20, 2018. ^ a b "Ilene Woods, the Voice of Disney's Cinderella, Dies at 81". The New York Times. July 6, 2010. Archived from the original on December 3, 2017. Retrieved November 29, 2018. ^ a b Moran, Kelsey (October 5, 2016). "The Real-Life Actresses Behind Your Favorite Disney Princesses". The Odyssey. Retrieved January 2, 2019. ^ Gwynn, Simon (November 28, 2018). "EBay and Harvey Nichols partner Disney ahead of bumper year of releases". Campaign. Retrieved January 21, 2019. ^ a b Uribe, Mariana (October 5, 2018). "Ralph Breaks the Internet Directors Announce Casting of Real-Life Internet Stars at New York Comic Con". Oh My Disney. Disney. Retrieved October 5, 2018. ^ Radish, Christina (September 20, 2018). "20 Things to Know about 'Ralph Breaks the Internet', Disney's 'Wreck-It Ralph' Sequel". Collider. Archived from the original on September 21, 2018. Retrieved October 5, 2018. ^ Dela Paz, Maggie (November 12, 2018). "New Ralph Breaks the Internet TV Spot Reveals Imagine Dragons Cameo". ComingSoon.net. Retrieved November 13, 2018. ^ "All of the easter eggs in Ralph Breaks the Internet". The Independent. 2018-12-01. Retrieved 2019-02-23. ^ Fuster, Jeremy (November 12, 2018). "Stan Lee Will Have a Cameo in 'Ralph Breaks the Internet'". TheWrap. Archived from the original on November 13, 2018. Retrieved November 13, 2018. ^ Scarnato, Ryden (November 14, 2018). "Stan Lee Never Saw His 'Ralph Breaks The Internet' Cameo". Heroic Hollywood. Retrieved November 25, 2018. ^ Collura, Scott (October 19, 2018). "The Kylo Ren Joke That Had to Be Changed for Ralph Breaks the Internet". IGN. Archived from the original on October 20, 2018. Retrieved October 20, 2018. ^ Burwick, Kevin (November 25, 2018). "The Golden Girls Almost Had a Big Cameo in Wreck-It Ralph 2". MovieWeb. Retrieved December 3, 2018. ^ "Ralph Breaks the Internet recaptures Wreck-It Ralph's magic". Polygon. November 14, 2018. Retrieved February 4, 2019. ^ "Spoilers! How those Disney princesses save the day in 'Ralph Breaks the Internet'". USA Today. November 25, 2018. Retrieved February 4, 2019. ^ Disney Wreck-It Ralph Director Rich Moore Is a Huge Gamer. GamerHub Videos. October 25, 2012. Event occurs at 4:22. Archived from the original on March 3, 2013. Retrieved October 25, 2012 – via YouTube. ^ Dekel-Daks, Tal (February 8, 2013). "'Wreck-It Ralph' director Rich Moore wants Nintendo's Mario for sequel". Digital Spy. Archived from the original on September 27, 2013. Retrieved September 24, 2013. ^ Vejvoda, Jim (February 4, 2013). "Wreck-It Ralph Director Wants Tron in the Sequel". IGN. Archived from the original on September 27, 2013. Retrieved September 24, 2013. ^ Roberts, Sheila (April 1, 2014). "Composer Henry Jackman Talks Captain America: The Winter Soldier, His Influences, Wreck-It Ralph 2, The Interview, and More". Collider. Archived from the original on June 12, 2016. Retrieved April 3, 2014. I can't tell you more, not because I'm being coy, but I believe that it is officially on the cards. I don't know any more other than a story is indeed being written. ^ Tilly, Chris (March 24, 2016). "Wreck-It Ralph 2 Still Happening, Might Feature Mario". IGN. Archived from the original on March 24, 2016. Retrieved March 24, 2016. ^ a b Snetiker, Marc (June 30, 2016). "Wreck-It Ralph 2 officially announced at Disney". Entertainment Weekly. Archived from the original on June 30, 2016. Retrieved June 30, 2016. ^ a b O'Brien, Lucy (March 28, 2017). "Wreck-It Ralph 2 is Called Ralph Breaks the Internet". IGN. Archived from the original on March 29, 2017. Retrieved March 28, 2017. ^ a b c McClintock, Pamela (July 10, 2018). "Disney Pushes 'Indiana Jones 5' a Year to 2021, Dates 'Maleficent 2,' 'Jungle Cruise'". The Hollywood Reporter. Archived from the original on July 10, 2018. Retrieved July 10, 2018. ^ Lussier, Germain (October 25, 2018). "Ralph Breaks the Internet Had a Few Totally Different Plots Before It Was Done". io9. Retrieved October 25, 2018. ^ Rougeau, Michael (September 20, 2018). "Wreck-It Ralph 2 Won't Shy Away From The Internet's Dark Side". GameSpot. Retrieved September 20, 2018. ^ "Oh My Disney – Official Site". Disney. Archived from the original on October 16, 2018. Retrieved October 22, 2018. ^ a b Sharma, Rucha (November 16, 2018). "I am happy that we were able to bring all princesses together: Animator Mark Henn on 'Ralph Breaks the Internet'". Daily News and Analysis. Retrieved January 14, 2019. ^ Brucculieri, Julia (August 13, 2018). "Disney Accused Of Lightening Princess Tiana's Skin Tone In 'Wreck It Ralph' Sequel". The Huffington Post. Archived from the original on October 6, 2018. Retrieved October 8, 2018. ^ a b c Schwartzel, Erich (September 20, 2018). "Disney Reanimates Portions of Upcoming Film After Criticism for Lightening Black Character's Skin". The Wall Street Journal. Archived from the original on October 1, 2018. Retrieved February 2, 2019. ^ a b Milligan, Mercedes (September 23, 2018). "Disney Reanimates 'Ralph's Tiana After Colorism Criticism". Animation Magazine. Archived from the original on September 26, 2018. Retrieved October 3, 2018. ^ Gutierrez, Lisa (September 27, 2018). "Anika Noni Rose goes to bat for Princess Tiana after Disney lightens her skin tone". The Kansas City Star. Archived from the original on September 28, 2018. Retrieved October 3, 2018. ^ a b c Lussier, Germain (November 26, 2018). "Ralph Breaks the Internet's Post-Credit Scenes Came With Some Major Hurdles". io9. Retrieved November 26, 2018. ^ Ding, Sophie (19 September 2018). "Watch Imagine Dragons' Meme-Filled Music Video For 'Zero'". Billboard. Retrieved 19 September 2018. ^ Paur, Joey (October 23, 2018). "Disney Releases Imagine Dragons' Zany RALPH BREAKS THE INTERNET Music Video Called "Zero"". GeekTyrant. Retrieved October 24, 2018. ^ a b c Iahn, Buddy (October 26, 2018). "Disney details 'Ralph Breaks the Internet' soundtrack". The Music Universe. Retrieved October 24, 2018. ^ Fullerton, Huw (December 3, 2018). "Ralph Breaks the Internet: Wreck-It Ralph 2's post-credits scenes explained". Radio Times. Retrieved December 4, 2018. ^ Han, Angie (April 6, 2014). "'Wreck-It Ralph' Sequel Officially in the Works, Composer Confirms". /Film. Archived from the original on September 3, 2017. Retrieved October 13, 2018. ^ a b McClintock, Pamela (April 25, 2017). "'Star Wars: Episode IX' Sets Summer 2019 Release Date". The Hollywood Reporter. Archived from the original on April 26, 2017. Retrieved April 25, 2017. ^ Lieberman, David (February 22, 2017). "Disney Films To Show On Imax Through 2019 With New Distribution Deal". Archived from the original on February 23, 2017. Retrieved March 2, 2017. ^ Lussier, Germain. "Watch How Ralph Breaks the Internet Brings the Internet to Life". io9. Retrieved October 31, 2018. ^ ""Ralph Breaks the Internet" Tickets on Sale, New Clip Debuts". Laughing Place. November 5, 2018. Retrieved December 4, 2018. ^ "Ralph Breaks the Internet premiere: Imagine Dragons, Taraji P Henson and Mandy Moore attend". The Indian Express. November 6, 2018. Retrieved November 8, 2018. ^ Marotta, Jenna (November 6, 2018). "'Ralph Breaks the Internet' Producer on Disney's Delayed Release". The Hollywood Reporter. Retrieved November 8, 2018. ^ "New Ralph Breaks The Internet Video Is All About Gal Gadot's Shank". CinemaBlend. November 8, 2018. Retrieved November 9, 2018. ^ Truitt, Brian (November 19, 2018). "Why that Disney princess moment matters in 'Ralph Breaks the Internet'". USA Today. Retrieved November 29, 2018. ^ White, James (October 10, 2018). "Final Ralph Breaks The Internet Trailer Surfs The Web". Empire. Retrieved December 6, 2018. ^ "Disney Debuts New Poster for "Ralph Breaks the Internet: Wreck-it-Ralph 2"". Laughing Place. February 26, 2018. Retrieved December 4, 2018. ^ Disney [@Disney] (February 27, 2018). ""There's no one I'd rather be than me." 😇😡" (Tweet). Retrieved February 27, 2018 – via Twitter. ^ Alexander, Julia (June 4, 2018). "Wreck-It Ralph 2 trailer mocks Google's annoying predictive search". Polygon. Retrieved October 23, 2018. ^ Bonomolo, Cameron (August 10, 2018). "New 'Wreck-It Ralph 2' Trailer Features Gal Gadot and More Disney Princesses". Movies. Retrieved August 12, 2018. ^ Liptak, Andrew (September 20, 2018). "The latest trailer for Ralph Breaks the Internet Rickrolls us all". The Verge. Retrieved October 15, 2018. ^ Elderkin, Beth (September 20, 2018). "Ralph Breaks the Internet's New Trailer Promises to 'Never Give You Up'". io9. Retrieved November 21, 2018. ^ "Carvana Brings Online Car Buying to "Ralph Breaks the Internet"". Business Wire. November 2, 2018. Retrieved November 4, 2018. ^ Rouse, Issac (November 30, 2018). "'Ralph Breaks the Internet' Teams up With BAPE for Playful Collaboration". Hypebeast. Retrieved December 3, 2018. ^ "Shop Ralph's Whole World". eBay. Archived from the original on December 10, 2018. Retrieved February 2, 2019. ^ Yazdani, Sheiva (December 12, 2018). "Free $25 Fandango Giftcards For Wreck-It Ralph 2: Ralph Breaks The Internet Giveaway". GameSpot. Retrieved December 13, 2018. ^ Slater, Shawn (October 19, 2018). "Sneak Peek from 'Ralph Breaks the Internet' Downloads into Disney Parks in November". Disney Parks Blog. Retrieved December 4, 2018. ^ Whitten, Sarah (February 27, 2018). "McDonald's reunites with Disney on Happy Meals after more than a decade apart". CNBC. Retrieved December 26, 2018. ^ Reif, Alex (November 15, 2018). "Disney "Ralph Breaks the Internet" Happy Meals at McDonalds". Laughing Place. Retrieved December 26, 2018. ^ Adams, Belinda (November 16, 2018). "Disney's 'Ralph Breaks the Internet' Sweepstakes". Netgear. Retrieved December 3, 2018. ^ Graham, Peter (November 2, 2018). "Ralph Breaks the Internet in Noovie ARcade's Latest Game". VRFocus. Retrieved December 8, 2018. ^ "Watch new TV ads from Apple, JBL, Kroger and more". Advertising Age. November 8, 2018. Retrieved December 4, 2018. ^ a b "Ralph Breaks the Internet". DVD Release Dates. Retrieved February 22, 2019. ^ "Ralph Breaks the Internet comes to Blu-ray on February 26th". TheCanadianTechie. January 17, 2019. Retrieved April 1, 2019. ^ Fandango Staff (January 15, 2019). "Exclusive: When You Can Watch 'Ralph Breaks the Internet' at Home". Fandango. Retrieved January 16, 2019. ^ McClintock, Pamela (November 20, 2018). "Box Office Preview: 'Ralph Breaks the Internet' to Win Holiday Turkey Trot". The Hollywood Reporter. Retrieved November 20, 2018. ^ Rubin, Rebecca (November 20, 2018). "Thanksgiving Box Office Battle: 'Ralph Breaks the Internet' to Top 'Creed II,' 'Robin Hood'". Variety. Retrieved November 20, 2018. ^ a b D'Alessandro, Anthony (November 25, 2018). "'Ralph' Scoring 2nd Best Thanksgiving Debut With $85M+; 'Creed II' The Holiday's Live-Action Opening Champ With $56M+". Deadline Hollywood. Retrieved November 25, 2018. ^ AFP (November 25, 2018). "'Ralph Breaks the Internet' -- and North American box office". Daily Mail. Retrieved November 27, 2018. ^ D'Alessandro, Anthony (December 2, 2018). "'Ralph' Breaking $25M+ 2nd Weekend; 'Grinch' Steals $203M+; 'Hannah Grace' $6M+ In Slow Post Thanksgiving Period – Sunday Update". Deadline Hollywood. Retrieved December 2, 2018. ^ a b D'Alessandro, Anthony (December 9, 2018). "'Ralph' Keeps No. 1 Away From Greedy 'Grinch' For Third Weekend In A Row With $16M+ – Sunday Update". Deadline. Retrieved December 9, 2018. ^ Sakoui, Anousha (December 9, 2018). "'Ralph Breaks the Internet' Pulls a Three-Peat With Fans". Forbes. Retrieved December 11, 2018. ^ Mendelson, Scott (December 20, 2018). "Illumination's 'The Grinch' Is Quietly Making Box Office History". Forbes. Retrieved January 1, 2019. ^ Nyren, Erin (December 15, 2018). "Box Office: 'Spider-Man: Into the Spider-Verse' Soars Toward $35-40 Million Debut". Variety. Retrieved January 1, 2019. ^ "Ralph Breaks the Internet (2018)". Rotten Tomatoes. Fandango Media. Retrieved February 22, 2019. ^ "Ralph Breaks the Internet Reviews". Metacritic. CBS Interactive. Retrieved December 28, 2018. ^ Ebiri, Bilge (November 19, 2018). "'Ralph Breaks the Internet' Review: Disney Gets Caught in the Web". The New York Times. Retrieved November 20, 2018. ^ Lowry, Brian (November 19, 2018). "'Ralph Breaks the Internet' runs up score on clever plot". CNN Entertainment. CNN. Retrieved November 20, 2018. ^ Lengel, Kerry (November 16, 2018). "'Ralph Breaks the Internet' review: All hail our pop-culture overlords". The Arizona Republic. Retrieved November 20, 2018. ^ Hartalub, Peter (November 19, 2018). "'Ralph Breaks the Internet' is a fun and inspired sequel, glitches and all". San Francisco Chronicle. Retrieved November 20, 2018. ^ Bumbray, Chris (November 16, 2018). "REVIEW: RALPH BREAKS THE INTERNET". JoBlo.com. Retrieved November 20, 2018. ^ Bishop, Bryan (November 14, 2018). "Ralph Breaks the Internet is The Lego Movie of Disney films". The Verge. Retrieved December 4, 2018. ^ Jones, Oliver (November 14, 2018). "The Dizzying Digital Wonderland in 'Ralph Breaks the Internet' Will Give You Whiplash". The New York Observer. Retrieved November 20, 2018. ^ Duralde, Alonso (November 14, 2018). "'Ralph Breaks the Internet' Film Review: Disappointing Sequel Offers a Few Good Clicks". TheWrap. Retrieved November 20, 2018. ^ Bradshaw, Peter (November 21, 2018). "Ralph Breaks the Internet review – virtually impossible to enjoy tiresome arcade game re-run". The Guardian. Retrieved November 24, 2018. ^ ""Roma," "The Favourite" and "A Star is Born" lead 2018 CFCA nominations" (Press release). Chicago Film Critics Association Awards. December 7, 2018. Archived from the original on December 8, 2018. Retrieved December 8, 2018. ^ "The 2018 Detroit Film Critics Society Awards". Detroit Film Critics Society. Retrieved December 9, 2018. ^ Staff, Variety (December 6, 2018). "Golden Globe Nominations: Complete List". Variety. Retrieved December 6, 2018. ^ Hammond, Pete (December 10, 2018). "Critics' Choice Awards Nominations: 'The Favourite' Tops With 14, 'Black Panther' A Marvel, 'First Man' Rebounds; 'The Americans' Leads TV Series". Deadline. Retrieved December 10, 2018. ^ "46th Annie Awards" (Press release). Annie Awards. December 3, 2018. Retrieved December 6, 2018. ^ Tapley, Kristopher (January 15, 2019). "'Avengers,' 'Lost in Space,' 'Ready Player One' Lead Visual Effects Society Nominations". Variety. Retrieved January 18, 2019. ^ "2018 Nominees". International Press Academy. November 2018. Archived from the original on December 20, 2018. Retrieved January 18, 2019. ^ Zahed, Ramin (January 22, 2019). "Nominations Announced for the 91st Academy Awards". Animation Magazine. Archived from the original on January 23, 2019. Retrieved January 24, 2019. ^ Eisenberg, Eric (November 5, 2018). "Could The Disney Princesses Carry Their Own Film Together? Ralph Breaks The Internet's Directors Weigh In". CinemaBlend. Archived from the original on November 12, 2018. Retrieved November 25, 2018. ^ Daniell, Mark (November 20, 2018). "John C. Reilly On 'Wreck-It Ralph 3': Ralph and Vanellope Should Go Into Space". Toronto Sun. Retrieved December 17, 2018. Julius, Jessica (2018). The Art of Ralph Breaks the Internet (1st ed.). Chronicle Books. ISBN 978-1452163680. Wikimedia Commons has media related to Ralph Breaks the Internet.